It's raining here and will be for the next 4 days! I needed a break so hubby took the kids this am while sis and I did some thrifting. 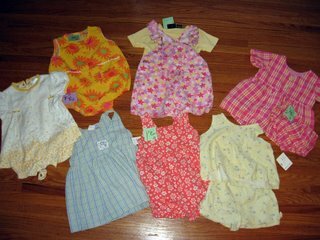 I needed clothes for Z and Q for summer and retail therapy is so much fun. Picked up a new fondue set, it's never been used! and it's avocado green! 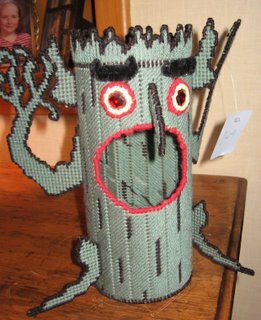 my sister found this lovely gem for her hubby's office, turns out It Came From Hell is his favorite movie of all time and anytime we find a scary tree guy we must buy it. I would love to meet the person who decided to make this in plastic canvas and needlepoint, truly bizarre! 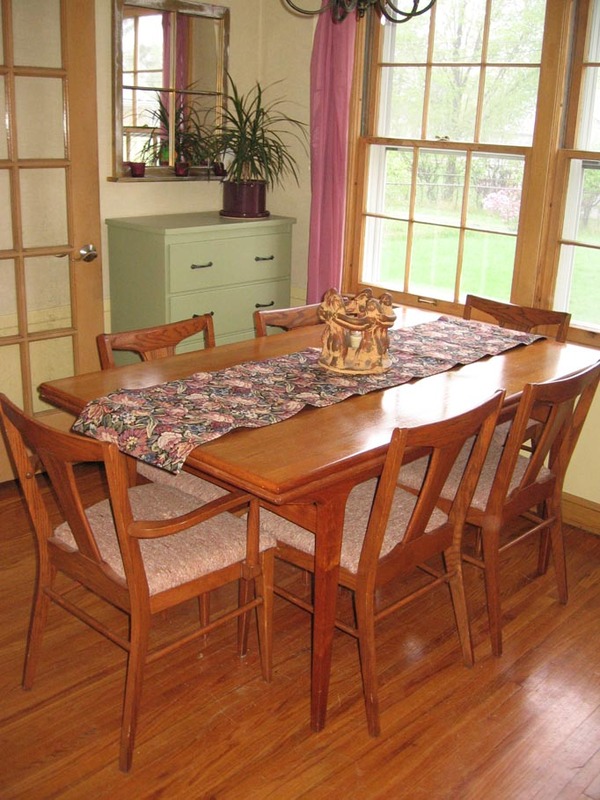 But, the deal of the day is my "new" teak dining table and oak chair set. Yes, I said set. 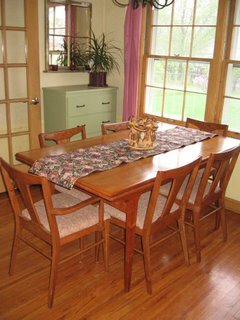 a table, that when both leaves are pulled out will sit 10 comfortably and 6 lovely chairs, 2 with arms (ok, the fabric is hideous but so very easy to recover) grand total, $149. We managed to get the whole thing in the minivan, all the while doing the dance, you know the one you do when you score big, yeah, that one. See, the deal was I was going to get this one at IKEA but the chairs would have broke the bank and the wood is softer and there is veneer involved. I LOVE IKEA furniture but this table has more heft to it and it already has a patina so I don't have to get all bent about paint or scratches or anything. I am just giddy at the idea of dinner parties. maybe I should do fondue? April 29, 2006 by carol strand.